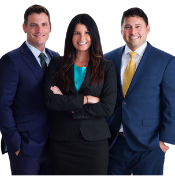 ‘We help people in legal crisis with personal injury, family law, and criminal defense cases. Our family law team helps with divorce, military divorce, men’s divorce, and child custody matters. Our personal injury team handles car accidents, insurance claims, slip and falls, and workplace injury cases.